The future looks bright for Lake Benton School. Enrollment is up, community support is solid and there is new playground equipment for the students. While new playground equipment was recently added, Lake Benton students still enjoy the old-fashioned merry-go-round. The older playground and monkey bars can be seen in the background. Lake Benton Public School has a lot to celebrate. 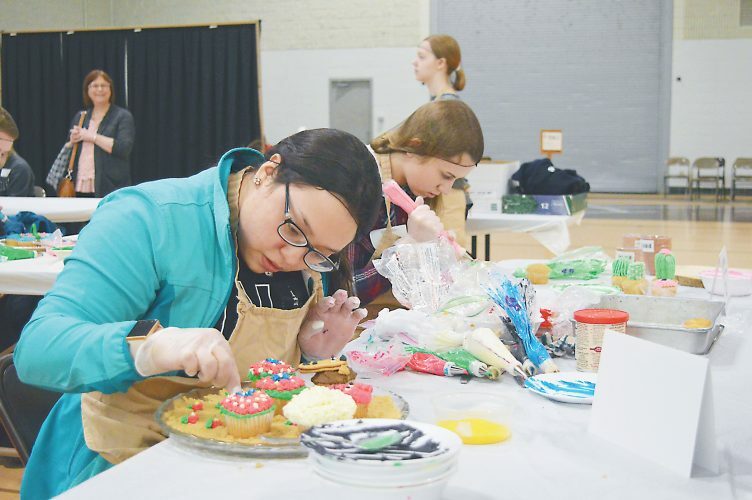 Not only has the district nearly doubled its enrollment from a decade ago, community support has also grown significantly. That support was evident at the elementary school’s open house and playground dedication recently. 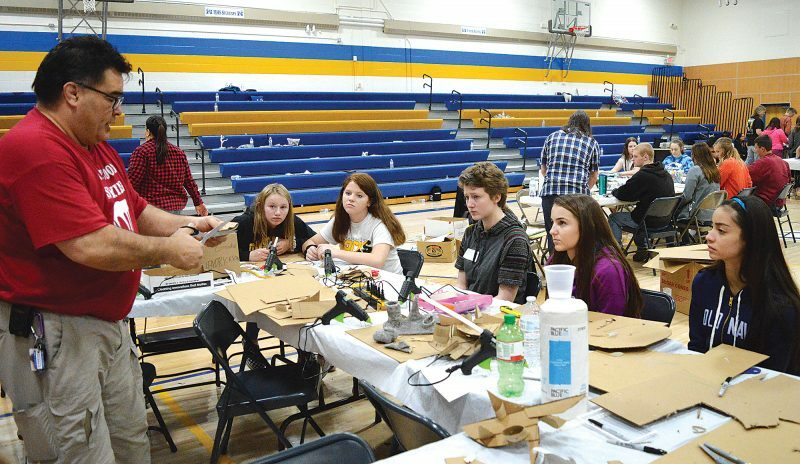 A decade ago, Lake Benton High School students began tuitioning to Elkton High School in Elkton, South Dakota, leaving the Lake Benton District with a K-6 school. Schwing said there were 86 K-6 students back then. Now, there are 175 students in pre-K through sixth grade, he said. Along with the community support, Schwing praised the school staff for making a positive difference. Paul Richter, a 2000 graduate of Lake Benton, recently returned to his hometown to raise his children — 8-year-old Gabriel and 6-year-old Lillian. 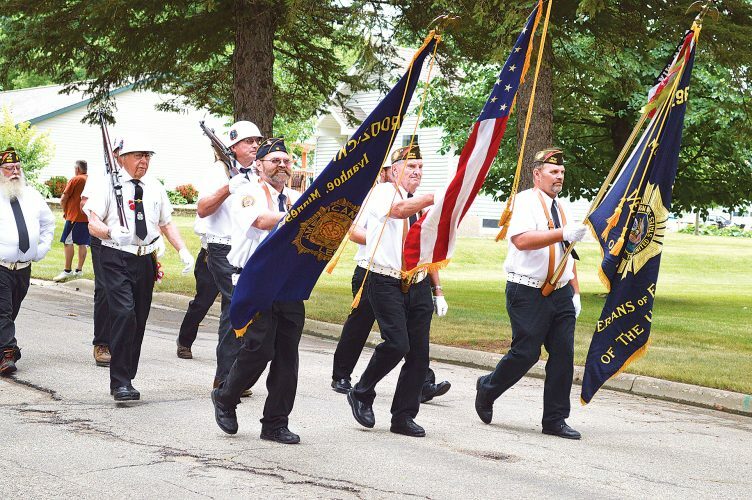 “When you’re looking for a good education and community to raise your children, you can’t get any better than what’s offered around here,” Richter said. 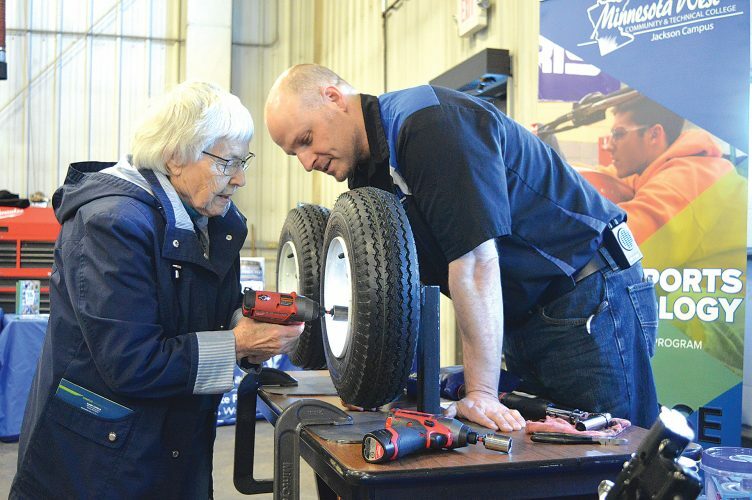 While a good education and a small-town atmosphere were at the top of the list for Richter, he was pleasantly surprised to be welcomed back in the way he was. Walking through the door at Lake Benton Elementary, Richter was soon greeted by friendly — and very familiar — faces. Not only did a custodian recognize him and recall his name, Richter’s former music teacher did the same. The sense of connectedness he felt solidified his decision to send his children to Lake Benton School. “It’s neat that my kids will have the same music teacher as I had,” Richter said. Richter also remembered the old playground and appreciated the upgrade. Sixth-grader Eli Detterman was also pleased with the playground additions. Detterman said he especially enjoyed the dunk tank — and more specifically, dunking new Principal Jeff Hansen — during the celebration. 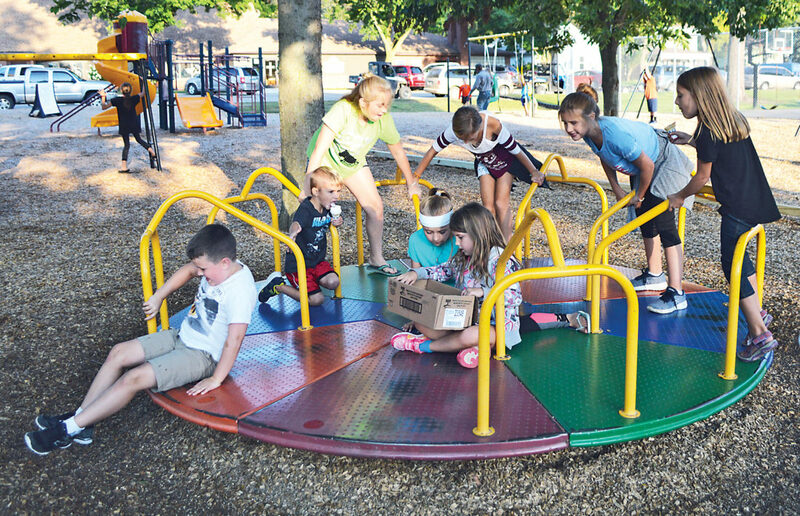 As a seventh-grade student, Collin Baartman now attends Elkton High School, but he still appeared to have fun at the playground with several other children in attendance at the open house and playground dedication. Lake Benton Volunteers for Education (LBVE) had a key role in fundraising for the playground additions. Member Janell DeVries said the LBVE is much like a parent-teacher association (PTA). DeVries said she thought the school kick-off event went really well. LBVE member Jenny Nordmeyer explained how the playground effort came to fruition. Some of the older equipment, such as the merry-go-round, metal jungle gym and monkey bars, was able to remain since there was enough space in the playground area after the new features were added. Nordmeyer said the group fundraised hard. LBVE member Deann Schindler said the Lake Benton Foundation gala helped bring in money for the cause. She also shared some of the ways that the LBVE fundraised for the playground project. In his address to the crowd, Schwing said there was no way he could mention everybody who had been a part of the recent effort, but that every contribution helped. Schwing said basketball courts and trees added the last couple of years had also been publicly funded. “That has left money for books and curriculum,” he said. As the open house ended, teachers and other personnel, including Superintendent Loy Woelber, joined the celebration. Carpenter said it’s amazing to see the school partner with the community and area businesses in the interest of students. In his closing remarks, Schwing said the future looked bright.